In the belly of a ship bound from the old world to the new, a Jewish man named Otto Rotfeld takes his final breath. A woman, assumed to be his wife, stands at his side. However, she is not a woman at all, but a golem, a creature made from clay and brought to life to do her master’s bidding by a practitioner of dark magic. Masterless, the Golem arrives in New York, with no sense of purpose or direction, save the desire to fulfill the unspoken needs of the people around her, which come to her unbidden. In a workshop in Little Syria, New York, a metal smith named Boutros Arbeely attempts to repair a copper flask brought to him by a customer. His interference unleashes a creature that has been trapped in the flask for hundreds of years. Around the jinni’s wrist is an iron band, trapping him in human form and restricting his magical abilities. A powerful wizard must have created the binding, but the jinni has no memory of being captured, and no notion of how much time has passed. Strangers in a strange land, both the golem and the jinni struggle to find a place in their new surroundings, while trying to conceal their true natures from the humans around them. They tentatively begin building delicate new lives which must inevitably go awry. Although the golem and the jinni share a similar predicament, their different personalities and essential natures are a study in contrasts. Steady and thoughtful, the golem is primarily concerned with appearing normal, and preventing herself from becoming a threat to others; she would rather destroy herself than cause harm. Whimsical and temperamental, the jinni seeks whatever pleasure he can find in human life while struggling to regain his natural form, with no regard for the consequences to others. Both characters chafe against their bonds, and find some small comfort in being able to be themselves in one another’s company when they eventually meet. The genius of this book lies in bringing to two characters and communities together as the situation plays out. Though the main characters and key elements of the plot are supernatural, the setting is grounded in historical fact. Wecker evokes the setting of 1899 Manhattan wonderfully, as seen from the alien perspectives of two supernatural beings who have become hopelessly entangled in human affairs. A motley assortment of supporting characters bring Little Syria and the Jewish community to life. Bit by bit, we learn the stories of Fadwa el Hadid, a Bedouin girl from the jinni’s past, and Ice Cream Saleh, a cursed Syrian immigrant who sees too much. Much like in The Night Circus, the characters and the setting carry the story as Wecker ponderously gathers the various threads necessary to finally bring the tale to its stunning conclusion. Exquisitely imagined and elaborated, The Golem and the Jinni is best read slowly, allowing ample time to soak up the details of this enthralling debut novel. 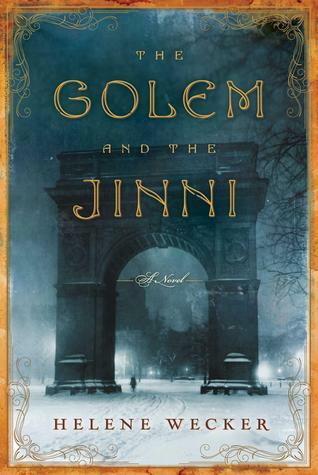 Already read and enjoyed The Golem and the Jinni? I recommend The Night Circus by Erin Morgenstern.